Once we get the reference to our Canvas instance, the following line of code retrieves the picture content itself and assigns it to the img variable. The trick here is that we retrieve that information in its URL format and, thus, encoded as Base64 data that we can assign to other document properties without losing its original meaning. Dim data As String = DecodeBase64(Hashtag.NthField(",",2) ) // We retrieve the information saved in the Hash, but just the relevant data for the image and not the URL part. ShowURL wp.URL // and finally we start the file download process. As you can see, in the first line of code we retrieve the image data. We do that using the NthField command because we are only interested in the image data and not in the URL information that precedes it. In addition, we decode the previously encoded data as Base64, so we really get the bytes of the image in PNG format. 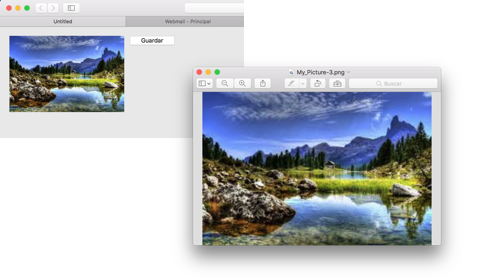 Once we get the picture data, we can use any of the available constructors for the WebPicture class; in this case the one that lets us create a new image from the passed data. In addition, we use this class because it is a subclass of WebFile, and that means that it is simpler to force the download as an image file instead of showing its contents in a new web page. In fact, this is what we achieve setting the ForceDownload property to True, so when in the following line we use ShowURL we will be forcing the download of the file instead of displaying the image as a new page in the browser. Goal achieved! Now, every time you run the app web and click the button, you’ll see how the web browser downloads the WebCanvas image as a PNG file to disk.